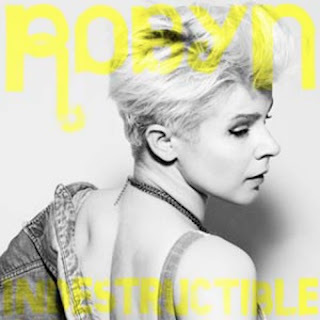 If there's one thing 2010 has taught us, it's Don't Underestimate Robyn. Some scoffed when the Swedish songstress announced her plans to release not one but three albums by the end of the year, but lo and behold: she's actually going to do it! Body Talk Pt. 3 has been given a November 30 US release date, and will reportedly include five tracks each from parts one and two as well as five all new tracks (it's being billed as the "complete Body Talk album"). It should not surprise anyone who's been paying attention that the lead single for Body Talk Pt. 3 is a fully produced dance edit of "Indestructible," an acoustic version of which closed Part 2. It's not quite the epic dance masterpiece I'd been hoping for, but neither does it sound like "Dancing on My Own" or "Hang With Me," the two lead singles from Parts 1 and 2, respectively, so color me pleasantly surprised.